Why Should We Make Friends with Our Feelings? Feelings. Yuck. Murky things that make us feel really uncomfortable. To people with overeating issues, feelings are about as welcome as a dog in a game of skittles. Our natural inclination is to run from our emotions, to avoid them like the plague. They’re so ambiguous, unsettling and uncertain. And we don’t like uncertainty. We like to be in control and know what to expect. We can learn to recognise and tolerate feelings without turning to food. Rather than stay with ourselves emotionally, time and again we abandon ourselves and reach for food. We don’t even have to be experiencing “negative” or challenging feelings. Many clients report that they turn to food when they’re feeling anything – sad, happy, frustrated, excited. Most of the time they’re not even aware of what they’re doing. There’s no thought process involved. Before they know it, they’ve switched to autopilot and are eating like there’s no tomorrow. And it works. Let’s admit that. In the short term, bingeing on food to bypass what you’re feeling works. Following a binge, you’re no longer in danger of experiencing those indistinct, confusing emotions. You know exactly what you’re feeling: you feel sick because you’re full to the point of bursting and you’re consumed with self-loathing because you’ve “failed” yet again. In this way, the physical and psychological aftermath of overeating is better than running the risk of experiencing what you were feeling in the first place. What would be so awful about acknowledging what you’re feeling? Many of my clients began using food as a coping mechanism when they were children because their emotional needs were unmet by their parents or carers. 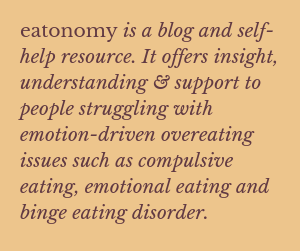 Food was their way of dissociating from feelings which would have been too overwhelming to experience – feelings such as abandonment, abuse, isolation, loneliness. As an adult, however, we can learn to recognise and tolerate these feelings without turning to food. Acknowledging your feelings is not a great, dramatic event. It doesn’t mean you run around telling anyone who’ll listen what you’re experiencing at any given moment. It’s a deeply personal process involving you getting to know and understand yourself better. Maybe start by becoming aware of what you’re feeling as you’re reading this. Is anything coming up for you? Are you feeling any discomfort? You don’t have to try to get an exact handle on what you’re feeling but just accepting that something is going on within you is a really good start. “I am feeling something” is still an acknowledgement. You may even be able to find some words that fit, such as “tense”, “resistant” or “intrigued”. Here’s a list of feeling words to help you. Emotions are a vital part of our experience and they clamour for our attention. Most people with overeating issues suffer from a lack of emotional language and, like any language, it takes time to learn. So please be patient with yourself. You don’t have to be perfect and you don’t have to get it “right”. Don’t let this be another thing you beat yourself up about. Above all, don’t judge your feelings. My clients will often say “it’s ridiculous that I feel like this” or “I shouldn’t feel this way”. If you dismiss your feelings you terminate the connection to them. And you need that connection, because using food to regulate your feelings may work in the short term but it really doesn’t work in the long term. Turning to food to soothe yourself ultimately doesn’t bring you comfort. Overeating and carrying a lot of excess weight make you really unhappy and get in the way of you living your life to the full. Therefore, bingeing doesn’t do the job you think it does – it doesn’t ease your distress, it contributes to it. Emotions are a vital part of our experience and they clamour for our attention. Just acknowledging them can reduce their energy so you feel calmer and are able to think more clearly. Try it and see how it feels. In time, you may find that, instead of resenting them like an uninvited house guest, you’re able to welcome them like a good friend. Here are some thoughts about how to get in touch with your feelings. ‹ PreviousWhy Is It Usual To Feel Conflicted? Next ›Why Are We Rebellious? I love this post. I have worked really hard in the past couple of years to come to terms with uncomfortable feelings, and to learn to “sit with them” and be okay with negative feelings. I realize that there was a lot of childhood conditioning going on, and food was a way that we dealt with discomfort in my family. I am grateful these habits can be unlearned though, and while it can seem hard at first, once you acquire this new skill, it is life-changing. Thanks for including the list of feeling words too. Very helpful. It’s really good to hear about your experience of learning to tolerate challenging feelings. Often people think they won’t be able to handle difficult emotions, especially if they learnt to detach from them in childhood, so it’s great that you prove it’s possible and that it has such a positive effect on your life. Many thanks for your comment.